If the earth beneath our feet could speak … Incompatible Elements: version 02 re-presents the relationship between nature and culture by reconfiguring land as active rather than neutral, verbal rather than mute, and therefore able to comment directly on the impacts of climate change. 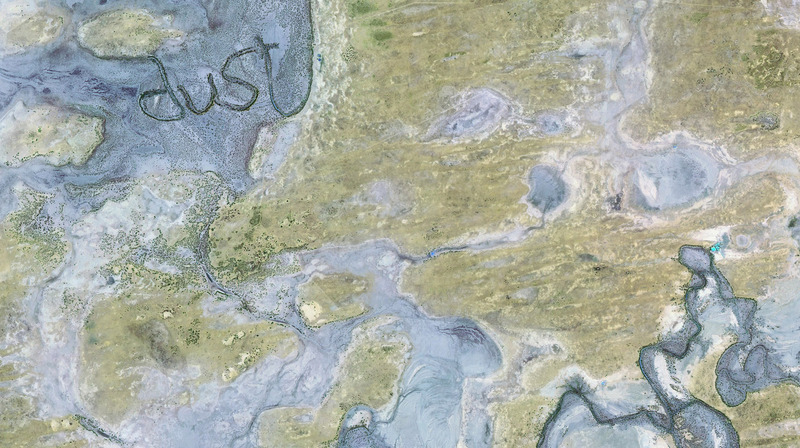 Building on the long tradition of artists combining text and image to communicate ideas and concepts, poetic texts are digitally embedded into satellite images of landscapes in crisis. In each digital print and video these texts reveal themselves dynamically, growing out of the landscape in different ways, the text design and method of reveal reflecting the qualities of the landscape. The focus is the Asia-Pacific region, with texts sourced from local custodians or appropriate works of literature. The ongoing Incompatible Elements project grew out of a residency at Performance Space, Carriageworks and has been supported by a New Work grant from the Visual Arts Board of the Australia Council. Leon Cmielewski and Josephine Starrs are Australian artists whose long term collaboration produces hybrid media art installations that often use play as a strategy for engaging with the social and political contradictions inherent in contemporary life. Their work is situated at the juncture of cinema, information visualisation, and data mapping, playing off the tensions between the large and small screen, and between information and sublime landscape.